Eko is an Italian musical instrument manufacturer. In the 1960s, that company factory-fitted some of their guitars and basses with DeArmond pickups. The two photos above show a 1960 Eko Cygnus guitar fitted with two Model 2000 chrome/white pickups in comparatively wide bezels. The pickup height adjustment screws are not visible. The pole-pieces have bevelled tops (photos copyright Carlos Gil, Galicia, Spain B0569). A range of electric guitars and basses under the Rokes brand name was produced by Eko in the 1960s. The instruments’ distinctive arrow-shaped body shape was designed in conjunction with The Rokes, a popular Italian pop group of that time. All Rokes instruments have the characteristic arrow shape, accentuated by the pointed headstock. Some of these instruments were factory-fitted with DeArmond pickups Models 2000 and 41 as shown below. The 1967 Rokes single-page catalog extract below, shows three models – the Rok Bass was fitted with a slanted Model 41 pickup, while the Rok VI and the Rok XII guitars are each shown with the same Model 2000 chrome/white pickup, fixed with two screws centrally located on the pickup’s short side. The page above is from a 1967 Rokes catalog. The instruments shown are (L-R) the Rok Bass with one slanted Model 41 pickup (see close-up photo below), the Rok VI and Rokes X11 guitars. 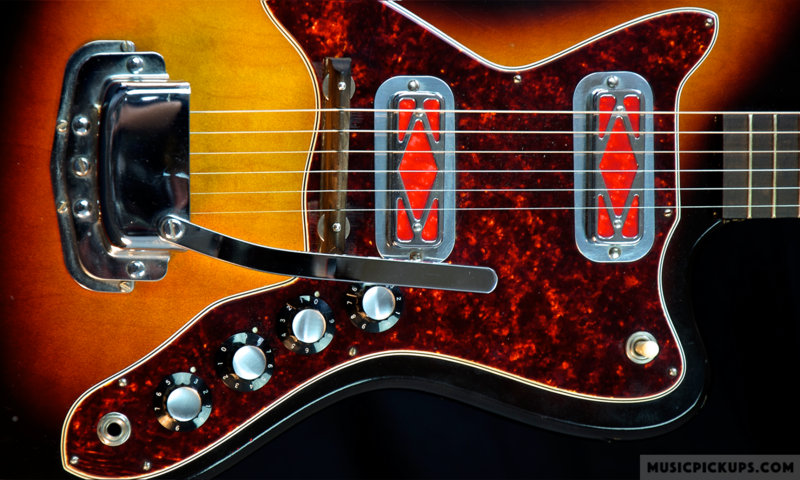 Both guitars are fitted with one Model 2000 chrome/black pickup, fixed by means of four screws through the pickguard into the four holes in the pickup’s bezel which is located under the pickguard. This Rok XII example’s chrome/black pickup is fixed by means of four screws through the pickguard into the four holes in the pickup’s bezel which is located under the pickguard. A Rok Bass, 1967, with one Model 41 pickup in chrome, without a DeArmond logo, mounted diagonally (Photo copyright Vic Gerard). Other Eko guitars seen include a solid-body bass with two Model 1000 pickup heads with red inserts. A publishable photo of this instrument is not available.